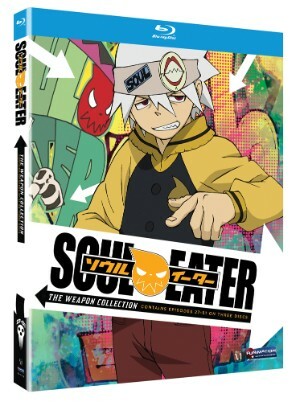 Soul Eater has seen its fair share of releases over the years. Only recently has Funimation thought to bring the series to the high definition market, taking double the amount of episodes available on previous releases and packaging them in one release across three discs. Soul Eater takes place in the a world similar but very much different from our own. Set in Death City, an academy founded by Lord Death himself made up of young students called meisters work with other peers who can transform into weapons to battle evil souls that would feed on the souls of the innocent. Maka is a studious young girl paired up with the laid back Soul, working to surpass those who have come before them and make Soul Lord Death’s personal weapon. The pair are joined by the symmetrically obsessed Kid, the eccentric Liz and Patty, the boisterous Black Star, and diminutive Tsubaki. The first collection chronicled the DWMA students’ battle against Medusa’s forces, resulting in the release of the fearsome Kishin. With Medusa’s downfall, a power vacuum is created, with a new witch called Arachne looking to fill the void. Naturally she is looking to continue the work of her predecessor, hoping to harness the power of the Kishin for her own means. While the DWMA students are organized for battle, Medusa looks to make one final bid at power, manipulating Professor Stein and her child Crona. It’s a slow burn that provides the series with a fresh bit of tension that ultimately climaxes in fantastic fashion. Unfortunately, the return of Medusa serves to show how much Arachne pales in comparison. She just doesn’t quite compare and brings little to the series other than being your typical plotting antagonist. On the plus side, all the oddball personalities that made the first half of the series an addicting watch are still in place. Maka’s and Soul’s chemistry is top notch and ranges among the best of any series. The characters are multi-faceted and have their own set of quirks that set them apart from each other. Soul Eater offers plenty of action and this set doesn’t disappoint. Nearly every episode contains at least one battle between the DWMA and Arachne’s forces, ultimately resulting in a final battle between Maka, Soul, Kid, Liz, Patty, Black Star, and Tusbaki challenging the godlike powers of the Kishin with fate of the world hanging in the balance. The bonus features offered here are ported over from the previous releases, which is a good thing considering they are well above the norm for anime extras. First up are two audio commentaries that put bring the actors together to discuss their characters and their experiences and thoughts on the series. Also included are the Soul Eater Late Show episodes that are good for a once over. Clean openings and closings close out the extras. Soul Eater is a fantastic series with wildly inventive characters and an energetic plot. If you have the series on DVD you could probably do without the Blu-ray, as nothing significant is offered to give consumers reason for the upgrade. However, if you haven’t seen the series before or are a fan and missed the boat the first time around, Funimation’s re-release is the way to go. Soul Eater is a series worthy of all anime fans attention.